hitting the Philippines on Nov. 9, 2013. 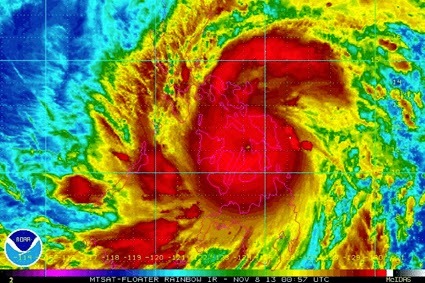 KIRF Director Mark Kirwin will be going to Philippines to deliver disaster relief supplies with a volunteer with family connections in the devastated country. "Super" Typhoon Haiyan which battered several islands last weekend has been the most devastating storm to hit the archipelago nation yet after years of increasingly severe typhoons battering the country. Unfortunately for the people living in the Philippines provinces of Cebu and Bohol, the typhoon came only a few weeks after a 7.5 earthquake hit and leveled homes and businesses. The thousands of homeless there had no protection when the typhoon came through last weekend with winds powerful enough to uproot palm trees and flood coastal towns with storm surges from the sea. Mark, who is attending the UN climate talks in Warsaw, Poland right now as a volunteer mediator with Mediator Beyond Borders, told me that there is a feeling of great concern for the people in the Philippines right now at the conference. The news of Typhoon Haiyan's devastating impact and the humanitarian crises unfolding in the Philippines has had a "sobering" affect on the mood of the UN COP19 climate conference with representatives of 192 countries attending according to a news report on Yahoo.com. 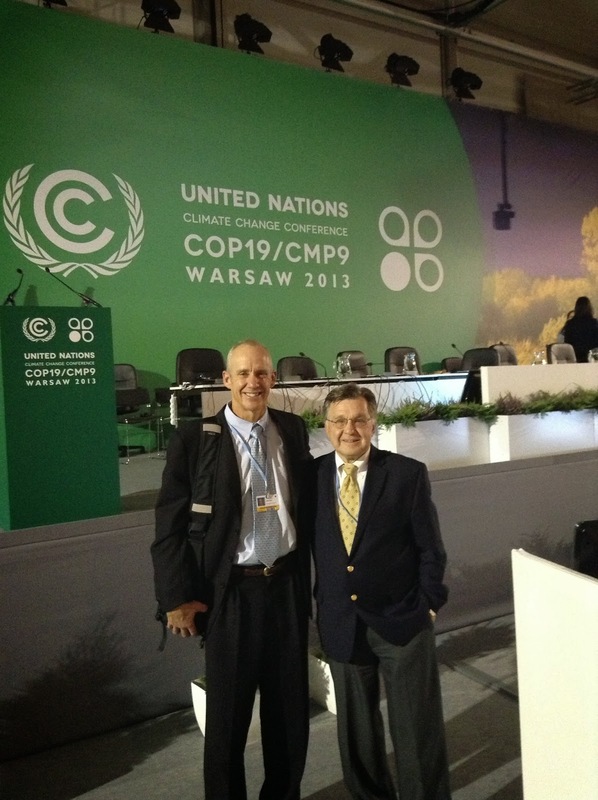 in the Philippines after COP19. Mark reported that the delegate from the Philippines announced yesterday at the conference that he was going to go on a hunger strike to emphasize to the other countries' delegates the catastrophic effects of what climate change is doing to the people of his country right now. According to a CNN report, the UN delegate from Philippines went on hunger strike to pressure delegates to agree to "concrete pledges" of financial support for to the Green Climate Fund-- an international fund to help developing nations to reduce their emissions and adapt to climate change impacts like Typhoon Haiyan. The increasingly severe typhoons to hit the Philippines since 1990 are the direct effects of anthropogenic climate change scientists believe. KIRF is working with a network of humanitarians in the Philippine community here in the United States as well as others to raise funds for a Stage II disaster relief trip to the affected area. Since communication is very difficult in the disaster zone with our local contacts there (cellular service is still down as is electricity and Internet), details of KIRF's relief trip will be posted here as they are available. For donations made on our website KIRFaid.org, in the Paypal checkout, please specify that the donation is going to "KIRF" (and not "KIRF INDIA"). Donations going to "KIRF" thru the month of November will automatically be set aside for disaster relief in the Philippines. Please leave your email address if you would like to received emailed updates about the disaster relief effort. Checks should be made out to “KIRF" or "Kirwin International Relief Foundation". Donations sent to KIRF are tax deductable. The Kirwin International Relief Foundation (aka "KIRF") is a non-profit 501(c)(3) organization founded in the state of California Tax I.D. # 27-3431829. The Kirwin International Relief Foundation is a humanitarian organization dedicated to helping others help themselves in a respectful and environmentally sustainable manner through our dual mission of disaster relief and education. Our on-the-ground disaster relief is done by experienced volunteers who pay their own airfare and work with humanitarians native to the area. Your donation can make a difference.